Notes from the future : I like how I call the MG/Rover Metro a modern car here. But I remember this being a good weekend, the race with the Metros was loads of fun. 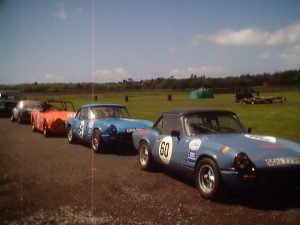 I think I mentioned the fuel pump mounting in another archive post, what was I doing..
Cymru, or Wales as we say, was the location for this double header. A race was to be held on each day, but only the Saturday one would count towards the championship. Again, we camped. But not in a tent, oh no, not any more, we now have a Land Rover 110 which has been converted into a camper van in the back. It makes an ace tow vehicle and is warmer, dryer and more spacious than a tent. It even has a gas powered fridge to keep post-race beers ice cold. Saturday was a ‘dayus horriblis’ for me, the car just wouldn’t run right, in either the very wet practice or the slightly dryer race and I couldn’t get the damn thing above 60mph on the straight. Despite finishing 3 laps behind, I soldiered on, I will at least get a couple of championship points for finishing. 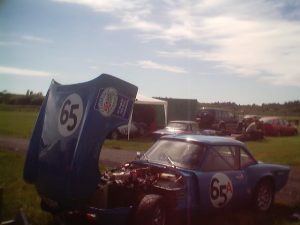 After the race (always bloody after isn’t it) the problem was traced back to my fuel pump which was mounted incorrectly (by me, doh!) and had become blocked, I borrowed a drill and cleaned al the filters and remounted it. Problem solved, I hope. On Sunday there was no practice, so I wasn’t going to be able to tell if the car was better or not until the race. I hoped it was, as due to a low entry the grid had been shared with MG Metros but the weather was stunning, all dry and sunny. At the green light, I pulled away well and kept a few (4 or 5) metros behind me. For most of the race I was engaged in a fight with a Metro that went like a rocket down the straights and like a paddle steamer around corners, a couple of times I nearly ran into the back of him. 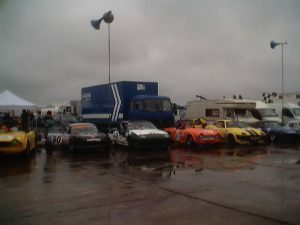 I finished 2nd in class, well enough for a ‘pot’ and was dead chuffed at keeping a pack of modern motors at bay. I just wished the car could have behaved as well in the championship race.